1961 - 2005. Koji Tano died on 31 July 2005 at the age of 44. M.S.B.R. 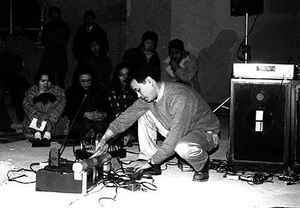 (Molten Salt Breeder Reactor), aka Koji Tano, was one of the most respected noise artists to emerge from Japan's vibrant noise/experimental music scene of the 90's. He played with countless other musicians and toured on 4 continents (Asia, Europe, North America and Australia). Much of his material was self-released on his own labels, one of which was dedicated to the production of limited edition cassette releases. MSBR's crushing wall of noise, like Merzbow's, managed to tap into a post-human territory of pure absolute volume that seems to have more in common with the unstoppable forces of nature than any form of music. For those of you who may not have downloaded the 10xCD tribute release years ago, it is still available here for free, with many beautiful words to this powerful artist.